Malic Acid, Citric Acid, Natural & Artificial Flavors, Sucralose, Silicon Dioxide. Mix 1 (one) scoop in 8-10 fl. oz. of cold water. 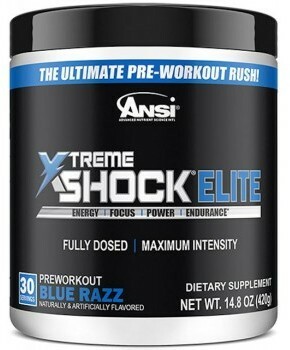 The World's Strongest PreWorkout Formula Takes Your Next Workout to the Xtreme! 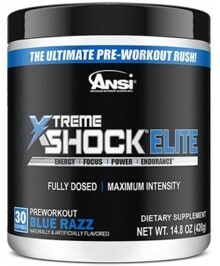 Xtreme Shock 420g Elite Powder. Just like our drink, now you can reap the benefits of your favorite Beta-Alanine drink whenever you want...just add water! From the very first gulp, Xtreme Shock's muscle pump formula promotes instant muscle energy surge and strength gains, plus buffers lactic acid build up, allowing you to do more reps to pack on new muscle, faster and easier than ever before.